Oh, if I wasn’t in love with this series already, there would have been hearts in my eyes at the end of this one. After reading what Allyson went through how can you not see what it was like for Willem? Summary: Willem’s story picks up the next morning of his and Lulu’s one day in Paris. And he wakes up in the hospital with a concussion. It’s the afternoon, he knows there’s something important he has to do but can’t remember what, until he does, and then he panics because he realizes he’s not with Lulu. He doesn’t want to miss her, he scrambles to get out of the hospital, and when he desperately runs back to the loft they shared she’s gone. Of course she’s gone. But he doesn’t give up hope just yet. Her stuff is back at Celine’s, maybe he can find something that could tell him about Lulu, like her real name for starters. She didn’t come back to get her stuff, there’s hope, except when he goes through her stuff nothing reveals who she is or where she’s from. And that’s when it kicks in. The feeling of loss. The sadness. The missed opportunity. And then we see Willem’s journey. We see just how much that one day with Lulu made a difference in his life. He tries to forget her at first. He hooks up with an old girlfriend which doesn’t work for him. When his friends see how different Willem seems they finally get him to tell them what’s wrong and they all pitch in to help him find his Lulu. First with Jacques and then with Cancun. We see his relationship with his mom, his friends, with himself. And then we see him accepting that it maybe wasn’t meant to be. Well, you already know how much I love this duology. I mean, there’s something about this story that resonated with me. I’m thinking it’s all the talk about destiny and fate and love and hope . . . and all that jazz. 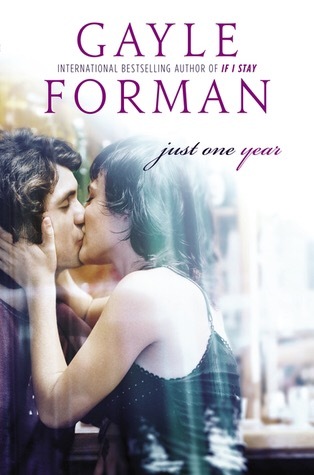 The way Forman continues Allyson and Willem’s story in this next installment is done so well. To see what that day meant to him and how their souls seem to fit with each other. Willem’s journey isn’t as smooth as Allyson’s (okay, maybe smooth isn’t the right word because I don’t think her journey was smooth either. Straight-forward maybe? Yeah, that sounds better), as straight-forward as Allyson’s was. I mean, remember, he’s been on the road for a while now, been on his own for a while now. He has his own challenges to face and seeing how Lulu influences his decisions, even when he doesn’t realize it, it’s exciting to read. As far as characters go, I love Willem, of course. I love seeing how he evolves after spending that day with Lulu. And I love Broodje! I swear, if I could ever have a best friend I want them to be like Broodje. He’s there for Willem through just about everything. He cares about his friend and wants to help him in anyway he can. Other characters I love seeing is Willem’s mom, Yael, and her relationship with her son. Still, when she takes her hand away, I wish she hadn’t. And when she starts packing up with promises of things we will do when she has a day off, I’m wishing I had told her about the skinheads, about Paris, about Lulu. Except even if I’d tried, I wouldn’t have known how. My mother and I, we both speak Dutch and english. But we never could speak the same language. “I haven’t found anything. And you might’ve asked me?” It comes out so bitter. And I realize she is. After all this time. Tears well up in my eyes. I’m grateful, in that small moment for the thousands of kilometers that separate us. “How soon could I come?” I ask. And the story tracks back to Shakespeare, which I thought was very clever. Willem’s story doesn’t really start with Shakespeare, but there are mentions of it here and there since that was the connection between Lulu and Willem, but that’s about it really, until you get to just before the One Day segment of the book. The connections in Willem’s story and Allyson’s story is done so well. You see the “almost” moments throughout the story (you’ll see what I mean). And I really love the way the book needs. I really do. It seemed the perfect ending for this story. So, if you can’t already tell, I’d recommend this book to anyone looking to find a story about an epic romance, an adventure, and the maybe-it’s-fate-maybe-not type of questions and answers.